Patrick grew up in Bay City, Michigan where he began playing the guitar and trumpet at age 6. Sticking with the guitar, he began to play clubs at the ripe age of 14. He toured with a fusion jazz group "Clockwork" in the late 70's before returning to school to study music. After moving to San Diego in 1982 he has established himself as a session musician and live performer in L.A. and San Diego. He has performed with Carl Evans Jr. of Fattburger, J Michael Verta, Greg Vail, and a host of other top musicians and vocalists in the southern California region. His music can be heard on the radio, television, and the worldwide Muzak corporation. He has been nominated as one of San Diegos top jazz musicians. Patricks 1998 release, "A Lasting Embrace" has been heard internationally. One of the tracks off that release made it on to a 'best of' smooth jazz release in Europe entitled "The Soul of Smooth Jazz vol.2". This release can be ordered through Tower records or the UK site "Jazzfm.com". Patricks music can be found right alongside Boney James, Bobby Caldwell, Richard Elliot, and other big names in the contemporary and smooth jazz genre on this 1999 release. Patricks music continues to grow and expand with this artists wide variety of musical styles and his undying love for the guitar. 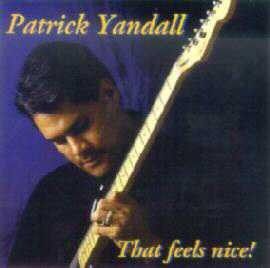 Smooth jazz guitarist Patrick Yandall second release and his first on this internationally known label. Artists such as Kilauea, Greg Vail, J Michael Verta, Richard Smith, Pocket Change can all be found on this very prestigious label BrainChild Records . This release with its urban flavor and Rythm and Blues influence highlights Patricks wonderful compositions and incredible virtuosity on the guitar. Soulful instrumentals complimented by a beautiful love ballad sung by Calvin Romance. Greg Vail on sax and flute. Former saxman from Kilauea and well into his solo career on the BrainChild Records label. One of the top session musicians in L.A..
Andre Mayeux - Formerly with Sheena Easton and a vast amount of recording projects brings his incredible talent as producer and handling all of the keyboardwork. Smitty Smith on bass. Boney James, Jeff Lorber, Natalie Cole, and many other top name artists utilize this very talented and soulful bassmans sound. Featured on"Artful Expression", a song Patrick dedicated to Art Porter. Robert Shipley on drums. Natalie Cole and longtime drummer for Chaka Kahn. A 'groovemaster" and featured on "Groove to Go". Brian Kilgore on percussion. What album "isn't" he on! From Dave Koz, Quincy Jones, Barbera Striesand, to Aerosmith. This incredibly talented individual creates moods and highlights sections the way no other percussionist can. Calvin Romance's vocal on "It's Alright" reflects of Luther, Freddy, and many other of the great balladeers. We'll all be hearing much more of Mr. Romance in the future. The title of Patrick Yandall's new album Of Two Cities is, for the literary minded, a takeoff of the classic Dickens novel A Tale of Two Cities. More to the point for this eclectic guitarist and consummate working musician, however, is its reference to his busy, freeway filled lifestyle running from gig to gig, studio to studio in San Diego and Los Angeles. Over the past year, in the midst of all the activity, he looked back over his two previous smooth jazz oriented albums, That Feels Nice (1992) and A Lasting Embrace (1999), and realized that while both he and the public liked them, they didn't quite express the entire palette of his musical heart. An artful, rhythmic and melodic blend of rock, blues, R&B/funk, jazz and fusion, Of Two Cities more perfectly captures the soul of the artist. "I'm grateful for all the work I do as a sideman, but recording albums is truly what I live for," he says enthusiastically. "I took a year off to spend with my baby son Marcus, and then had to get right back into the studio and work on new material. A lot of the music on A Lasting Embrace was originally written for other composing projects, and I didn't feel that I was painting a full picture of myself. I only used one acoustic guitar, while this time I played a lot of electric guitar to show an edgier side of myself. It's as if I limited myself before, and Of Two Cities is like a coming out party. For me the thread through each of the songs is the freedom I felt to express myself any way I could." The Bay City, Michigan native once again collaborated in the studio with producer/keyboardist Andre Mayeux, who produced A Lasting Embrace. Yandall complements his multi-faceted guitarisma this time with two of the biggest names on the Southern California studio and club scenes, bassist Jerry Watts and saxman Greg Vail. Of Two Cities opens with "Marcus," a moody, swaying retro-soul flavored tribute to Yandall's son (who was named after famed bassist Marcus Miller! ), then rips into the bright, edgy funk of the title track with a playful dance between electric guitar and sax. Mayeux simulates a crisp, seductive Fender Rhodes flavor on the hypnotic, cool ballad "Nocturnal Maneuvers," and contributes an elegant piano solo to his own composition, the dreamy, acoustic guitar driven "City of Dreams." Yandall brilliantly mixes acoustic and electric on the explosive ode to "Mt. Pleasant" (the location of his alma mater Central Michigan University) before engaging in a blistering electric rock-blues explosion on "200 Watts" (named for the bass player). Any hardworking musician can relate to the theme behind the simmering electric guitar ballad "Playing the Price"--it's Yandall's acknowledgement of paying his proverbial dues. One of the album's most fun free for alls is "Blues on 5th Avenue," which captures the wild energy of Manhattan mixing electric guitar, sax and blues and jazz vibes. A thick percussive groove brings to life "A Night at Seau's" (named for a popular San Diego nightclub), while "Cajun Blue" and "Just For the Asking" find Yandall rocking, rolling, getting bluesy and basically celebrating every reason he ever became a guitarist. Yandall's wife will sometimes tease the guitarist that he's staring into space, off thinking of new music in his mind again, at the most inappropriate moments. "All I can say is that music is part of my soul," he says. "I wake up thinking about it, and go to bed doing the same. It's great to have the opportunity to play and be appreciated." His jazz musician father and the long recuperation time from a broken hip led him to try the trumpet and guitar at age six, and by thirteen Yandall was playing with jazz and rock bands in underage clubs. Equally adept at the progressive rock of Genesis and yes and the more complex ideas of jazz, Yandall chose to focus on fusion based on a summer symposium at the Berklee College of Music and his admiration for the pop/soul/jazz stylings of keyboard great Jeff Lorber. "I discovered that my playing was compatible with the way a jazz oriented player could stretch out and improvise at any time," he recalls. Yandall's electric guitar sound owes a bit as well to heavy childhood influences George Benson and Wes Montgomery. As for blues, "there's always been a lot of blues in jazz. Blues started with jazz. It's all related." He moved out from Michigan to San Diego after high school, but went back to briefly attend Central Michigan University. In between his studies, he hooked up with the jazz/fusion group Clockwork and wound up touring with them for two years, opening for artists like Chick Corea and Jean Luc Ponty. He moved back to San Diego in the early 80s, where he immediately hooked up with Devotion, a popular Earth, Wind & Fire type band with a five piece horn section. He later did studio work with the well known production company Jam Power, and co-wrote and played with The Chill, an R&B outfit signed to Orpheus/Capitol Records. While keeping extraordinarily busy in San Diego and Los Angeles--in addition to headlining his own shows, his latest longterm side gigs are with Fattburger's Carl Evans, Jr. and R&B vocalist Calvin Romance, and he does numerous solo shows), Yandall released two albums in the 90s--the fusion oriented That Feels Nice (1992) and the smooth jazz flavored A Lasting Embrace (1997). He recorded the second album for Dean Whitney's label Brainchild, which launched the career of Russ Freeman in the mid-1980s. "My two biggest goals as a musician were to make a living making music and having audiences appreciate what I do," he says. "I've achieved those so far, but I'm always trying to reach higher and stay better focused on my writing and playing. Playing for audiences and making them happy is still the ultimate." The title Of Two Cities may be centered around Yandall's busy Southern California-based career, but its exciting array of musical styles is bound to cause a universal stir. Dickens' novel begins, "It was the best of times...it was the worst of times..." It doesn't take a genius to know which times these are for Yandall at the start of the new millennium.